"It is the same with the Son of Man. The Son of Man did not come for other people to serve him. The Son of Man came to serve other people. The Son of Man came to give his life to save many people." Jesus left heaven with one key purpose in mind: he would come to earth to pay the ransom demand of Satan for our soul. He would pay that price with humiliation, rejection, being mocked and beaten. But that is why he came. Not only did he know how desperately we needed to be saved, he also knew how important it was that we have a Savior! He came and lived and died as both. Because he paid our ransom he can also plead our case to the Father as our advocate. Because he paid the price to redeem and ransom us, we can not only trust what he says but also know that he hears us and cares for us when we struggle. 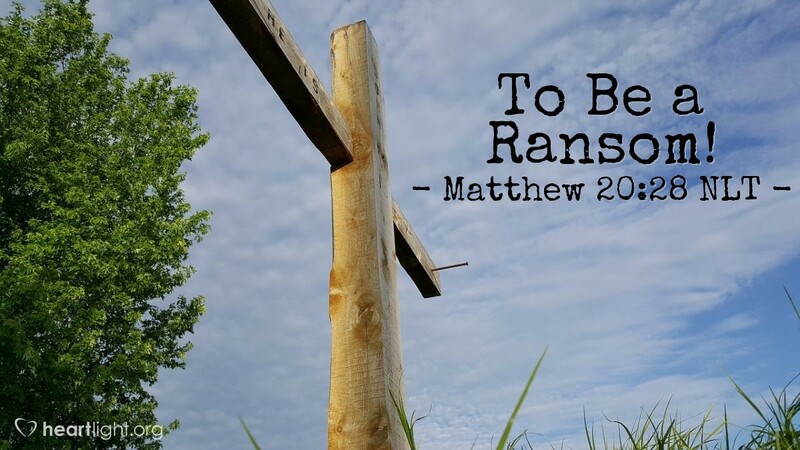 Jesus is both ransom and mediator, sacrifice and High Priest, Savior and Friend. Holy and Righteous One, God Almighty whose holiness I can neither comprehend or approach—I thank you for Jesus. I thank you for your plan to send him to redeem me and atone for my sins. I thank you for his faithfulness to you and your will.I thank you for his courage and compassion as he died for me while being mocked, spat upon, and belittled. I want my life to honor his sacrifice. While I know I can never be worthy of such a great gift, I want my mistakes, sins, and shortcomings to be because I tried passionately to honor you, not because I grew lackadaisical in my discipleship. Thank you so much from the bottom of my heart for saving me. In the name of Jesus, my mediator who paid my ransom price, I pray. Amen.